On Saturday July 28th, Serenity Langford was outside playing with her neighbors and friends with Mom, Veronica, looking on. A split second decision on 4 year old Serenity's part would change her life forever. As Serenity crossed her familiar apartment parking lot a large SUV pulled into the complex and hit her, running over her small body with both front and back passenger tires. Mom, Veronica, witnessed the whole thing - powerless to stop what was happening but immediately at Serenity's side. Amazingly, Serenity was conscious - but screaming in pain. The driver of the SUV had not realized he hit anything until he heard Veronica screaming for help and saw her with her child. The male driver of the SUV begged Serenity's parents, Veronica and Travis, to NOT call 911. When they called for an ambulance the driver took off running on foot, abandoning his girlfriend and her SUV he was driving. Serenity miraculously survived the accident with no internal injuries. Her pelvic bones are riddled with fractures. As a young child her bones are more malleable so they should still heal but the process will be very long. 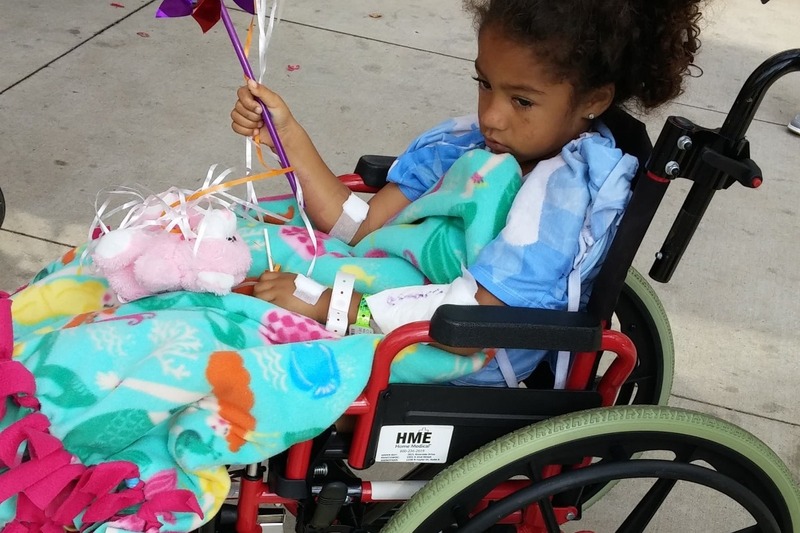 At time of release from hospital Serenity is unable to bear her own weight on her pelvic bone; she requires a wheelchair to be transported anywhere. Her parents must carry her to the bathroom. She will slowly begin to rehabilitate with the use of a walker. Being completely dependant on her parents for care means Veronica and Travis will be missing even more work as they continue to take care of Serenity and help her learn to walk again. I am starting this Go Fund Me to help the family with copays, medical supply costs and missing wages from time in the hospital and the months of recovery ahead of her. Serenity has a 7-month old baby brother at home as well. The family appreciates everyone who has sent well wishes and prayers to Serenity and her family. They also want to thank everyone who shared the news story online and hope the Police will one day catch the man who ran away from this accident instead of taking responsibility. Thank you all for everything! Look who's using her walker!!! 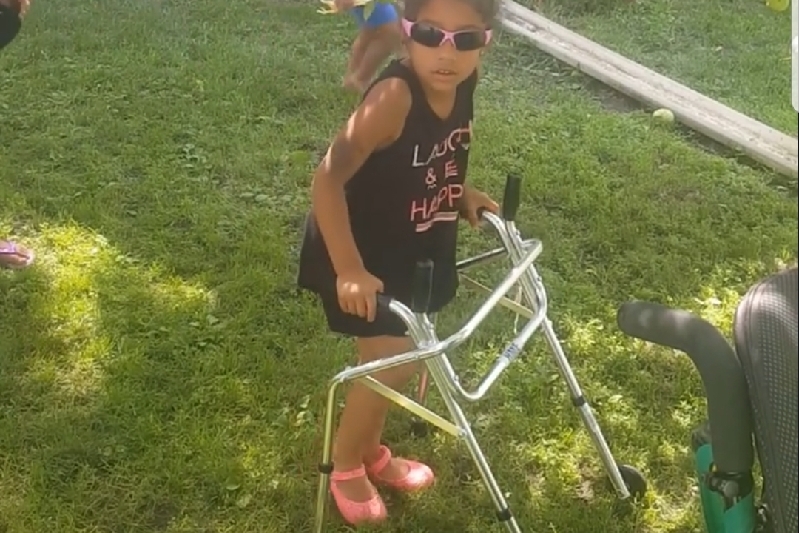 It's been a week and a few days since the accident and Serenity is getting more comfortable with her walker! She can pull herself up on it from sitting and even managed to scoot across the grassy yard! She is still in some pain and discomfort, mostly on her right side, but is being a trooper!! Serenity still needs help going to the bathroom and cannot get upstairs to her own bed without being carried. She is terrified of parking lots. She can still remember vivid details of the accident. Serenity has Physical Therapy appointment, blood tests and follow up with the Trauma Doctor on Friday. Things are slow but steady - she is coming along well. Mom has been home with her every day and is so proud of how well she is doing! We thank everyone for their donations, shares and LOVE and Prayers sent - they are definitely helping! !